Usually on my blog I only talk about something if I actually like it (god loves an honest person). I see no point in blogging about a product or topic if it didn’t work for me or I had no interest in it, but today I’m going to do a post dedicated to stuff I didn’t particually like. This is just my own opinion of the products and this isn’t a complete hatred against certain brands, just some products that weren’t for me and why. The first of the 5 products I’m going to talk about today is the Lush Ocean Salt Body Scrub. I am a really big fan of body scrubs as they do a brilliant job of exfoliating your skin and removing all the dead skin cells, dirt and offering body protection. This certain scrub is designed for use on the face and body, which is fine… other than when I used it on my face it left me red raw with seriously irritated skin. As a body scrub this was fine it worked perfectly but it has a very thick and rough texture which when used on my face didn’t work well at all. If you are going to purchase this product I suggest using it just for your body, or testing it on a small area of your face first. My second product did a similar job. Can I just add, I use face scrubs all the time and most don’t cause any irritation if they have fine beads and aren’t too rough. The Clinique Face Scrub Exfoliant did near enough the same thing as the Lush scrub. It left my skin very dehydrated and stripped, also leaving red patches around my face. This was definitely a no go for me. 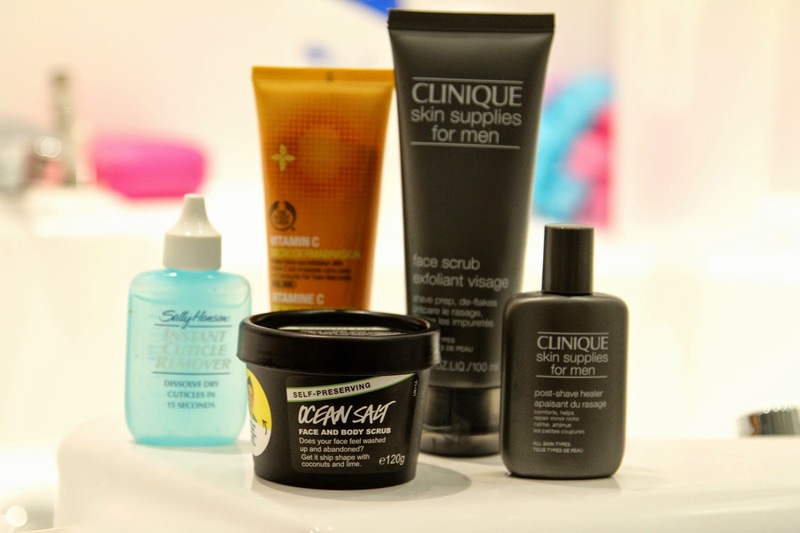 While were on the Clinique products, another one I wasn’t impressed with was the Clinique for Men Post Shave Healer. When it comes to wet shaving I always keep the bottom of my stubble neat and tidy and love using products that take away the redness and the occasional shaving rash. When I first bought this product I thought it would do wonders at preventing rashes and irritation, however it did the complete opposite. It left me with white spots around where I had been shaving that were a nightmare to get rid of. I thought it was a one off happening so I tried it again and again when I shaved and still these little white devils kept appearing. Considering Clinique is a brand that has done wonders to my skin and I love so so many of their products this was a little bit of a let down for me. Moving swiftly on, lets talk about nails. I have used many cuticle remover products in the past and one that seems to be a popular pick is the Sally Hansen Cuticle Remover Gel. To be honest this isn’t a product I hate or really dislike, it just didn’t work as well as others have for me. My cuticles weren’t softened that much and left a gewwy excess unlike some that soak into your cuticles. Just not the one for me thats all. Lastly, this product was suggested to me by the staff at The Body Shop as a brilliant home spa treatment product that apparently was one of the best sellers. The Body Shop Vitamin C Microdermabrasion Scrub didn’t really do anything at all to my skin like it was made out to. I tried it for 3 weeks, twice a week but no change. Apparently it’s suppose to leave your skin looking radiant especially the next morning, but for me it didn’t do anything. I can’t say this is a bad product due to the ratings (its obviously working for some people), but for me I wouldn’t buy this again. A little pricy too for The Body Shop so I was expecting results.